Kenyon cell claws (indicated with boxes) extend from a single cell body in the fruit fly brain. 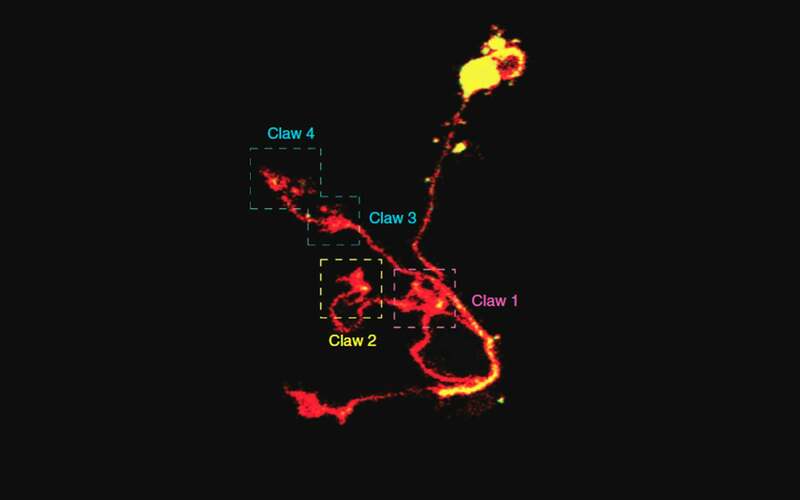 CSHL researchers have found that each claw responds to different chemical compounds, and multiple claws must be stimulated in order for the Kenyon cell to become active. In this way, the Kenyon cells are the integration point that allows the fly to 'remember' a smell. Cold Spring Harbor, NY — Think of the smell of an orange, a lemon, and a grapefruit. Each has strong acidic notes mixed with sweetness. And yet each fresh, bright scent is distinguishable from its relatives. These fruits smell similar because they share many chemical compounds. How, then does the brain tell them apart? How does the brain remember a complex and often overlapping chemical signature as a particular scent? Researchers at Cold Spring Harbor Laboratory (CSHL) are using the fruit fly to discover how the brain integrates multiple signals to identify one unique smell. It’s work that has a broader implication for how flies—and ultimately, people—learn. In work published today in Nature Neuroscience, a team led by Associate Professor Glenn Turner describes how a group of neurons in the fruit fly brain recognize multiple individual chemicals in combination in order to define, or remember, a single scent. The olfactory system of a fruit fly begins at the equivalent of our nose, where a series of neurons sense and respond to very specific chemicals. These neurons pass their signal on to a group of cells called projection neurons. Then the signal undergoes a transformation as it is passed to a body of neurons in the fly brain called Kenyon cells. Kenyon cells have multiple, extremely large protrusions that grasp the projection neurons with a claw-like structure. Each Kenyon cell claw is wrapped tightly around only one projection neuron, meaning that it receives a signal from just one type of input. In addition to their unique structure, Kenyon cells are also remarkable for their selectivity. Because they’re selective, they aren’t often activated. Yet little is known about what in fact makes them decide to fire a signal. Turner and colleague Eyal Gruntman, who is lead author on their new paper, used cutting-edge microscopy to explore the chemical response profile for multiple claws on one Kenyon cell. They found that each claw, even on a single Kenyon cell, responded to different odor molecules. Additional experiments using light to stimulate individual neurons (a technique called optogenetics) revealed that single Kenyon cells were only activated when several of their claws were simultaneously stimulated, explaining why they so rarely fire. Taken together, this work explains how individual Kenyon cells can integrate multiple signals in the brain to “remember” the particular chemical mixture as a single, distinct odor. Turner will next try to determine “what controls which claws are connected, and how strong those connections are.” This will provide insight into how the brain learns to assign a specific mix of chemicals as defining a particular scent. But beyond simple odor detection, the research has more general implications for learning. For Turner, the question driving his work forward is: what in the brain changes when you learn something? The research described in this release was supported by the Elisabeth Sloan Livingston fellowship from the Watson School of Biological Sciences. and the US National Institutes of Health grant R01 DC010403-01A1.